In the middle of February, Vermont is bleak and grey. After Christmas and New Years has passed, the enchantment of winter fades and I often find myself craving an adventure in a far-away place where the sun shines and the world isn’t so still. This year, I packed my bag with sunscreen and bug repellent and boarded a plane for a twosome adventure with my mother into the Tuscon desert. Mom has been to Arizona several times over the past few years– she loves the dry heat and cool nights, hiking through state parks and observing wildlife. It’s her lifelong dream to retire, buy a tiny mobile home, and drive off into the Arizona sunset. Though the heat was oppressive on our first day hike, I was thrilled to see a diverse and thriving landscape so different from the Green Mountains. Though mountainous, the Vermont trees were replaced by cacti and succulents, and mountain ridges were orange with sediment. We parked our rental car at Tuscon Mountain Park and followed the Brown Mountain trail which led us over several small hills and ended at the Arizona-Sonora Desert Museum. 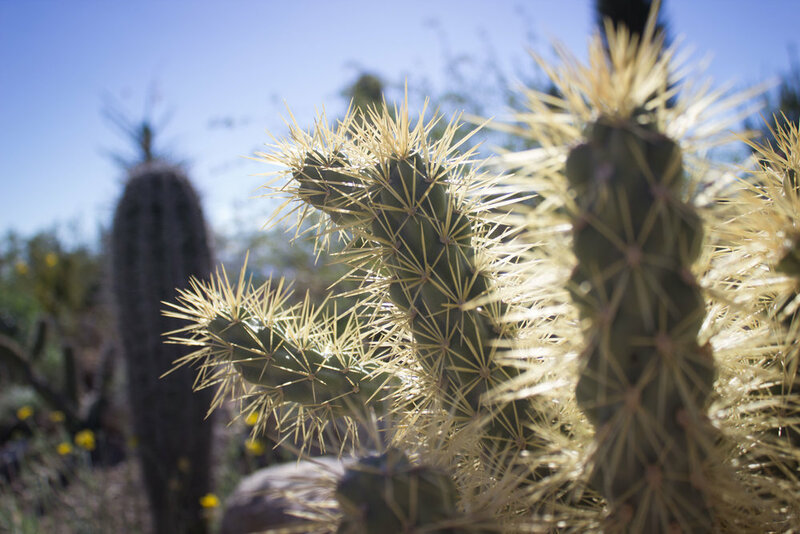 The museum features incredible gardens with vegetation ranging from the brightly colored Yellowflower Indian Mallow to the pineapple-shaped flowers featured on the Arizona Barrel Cactus. The silhouettes of coral-shaped cacti in front of the afternoon sun reminded me of an underwater scene similar to the Hol Chan Marine Reserve in Belize. We spent the second half of our adventure in the mountains of Sedona, an immaculately breathtaking town set in the valley of the red rock cliffs. The town is known for its spiritual energy that draws in people from the west coast. Though I found the number of palm-reading shops in this town a bit excessive, there was an energy and vibrancy to the area that will surely bring me back. The two of us explored the Airport Loop Trail, which brought us around the rocky bluffs in a moderate 3-mile hike. Settling in for the night, we settled into a wine bar in the center of town, Vino de Sedona, a small hole in the wall that featured live acoustic music and delicious bruschetta. Reminiscing on our hike from the day, I envisioned myself back on the edge of the canyon, from where I truly felt on top of the world.